Why to use solids control equipment? Cuttings in drilling mud as the main harmful solids will affect the performance of the drilling fluids during the drilling process. It will make the drilling mud density, viscosity, abrasiveness, glutinousness, dynamic resistance increased. In addition to this, cuttings is harmful to the oil & gas layer, such as reducing the drilling speed, increasing the rotary torque, leading to well leakage and blowout. So we must adopt some measures to solve t above problem, drilling fluids shale shaker as first stage equipment for purifying drilling mud is widely used in many industries. As the important one of solids control system, shale shaker is the first phase mud treatment equipment. Drilling fluids carrying the cuttings to the wellhead. These cuttings will be removed by shale shaker on time and then get into the next stage to be purified again. It is the idea equipment to remove the cuttings among the solids control equipments. If the shale shaker does not work correctly, the subsequent equipment like hydrocyclones and centrifuge cannot work as normal. 1) Sieving the liquid and discarding the solid phase particle. 2) Sieving the solid particle from 0~20μm. Currently the max screen mesh is up to 325 mesh. Seldom use the mesh less than 40 mesh. 3) Due to the characteristic of the well drilling, the shale shaker should be easy to transport, installation, replace the screen, operating, also have less quick-wear parts. 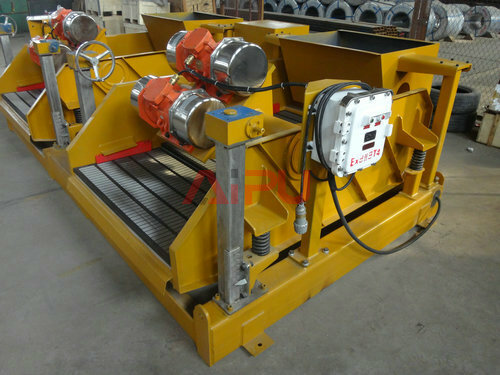 In order to improve the separation size of vibrating screen and processing efficient. The structure becomes more and more complex. It is divided into circular trace, linear trace, balance elliptical motion in accordance with screen box trajectories. Presently, with the improve of drilling request, shale shaker design and develop also meet the most of operators’ request. The linear and balance elliptical shale shaker are popularly used around the world. As a processional solids control manufacturer in this industry, Aipu is capable of providing customers a series of products, such as oil & gas drilling fluid solids control equipment, drilling decanter centrifuge, drilling waste management equipment and drilling security equipment.